Aprilia is no stranger to adventure sport, and its experience in producing off-roaders spans right back to the early seventies, when Aprilia motocross bikes won Italian championships and even had some success in world championship motocross grand prix. In 1992, the same year Alessandro Gramigni won Aprilia’s first 125cc Road Racing World Championship, the still very small company from Noale in Northern Italy also won its first off-road world championship title with Aprilia factory trials rider Tommi Ahvala. Another world title followed with the indoor series in 1993 before Aprilia ceased production of the Climber trials machines. Add to these successes the three individual and four manufacturer world supermoto titles and highly competitive performances in the Dakar with its exquisitely engineered 450cc and 550cc V-twin range, and you can see that Aprilia is far from being a newbie in the off-road world. Aprilia was also one of the first manufacturers on the scene with a production ‘rally’ styled machine – the Tuareg models, which ran from 1984 to 1992 in a range of sizes from 125cc to 600cc. Rumours of a revived Tuareg range following Aprilia’s successful Dakar campaigns in 2010-11 – winning stage victories in both years and third overall in 2011 – never materialised. With all its history, it seems incredible that the only model in the current Aprilia range with genuine off-road intentions is a lightly massaged version of the very much road-focused Caponord 1200. But as the Caponord Rally proves, when dirt gets into your blood, it sticks. The first thing to understand about adventure bikes of this size and weight is that they are not enduro bikes. 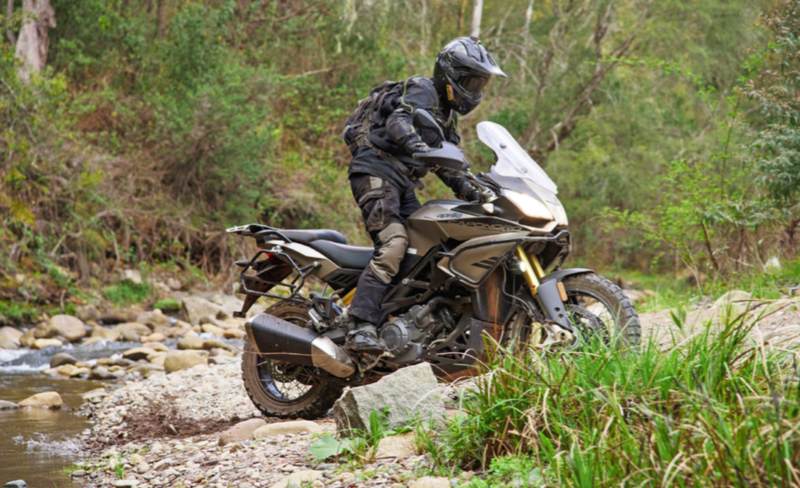 That may seem to be stating the bleeding obvious, but it is important to know, now that there are so many motorcycles claiming to be off-road ready. The naming of models can infer suitability for off-road use that sometimes goes far beyond the realms of reality. Take the Caponord Rally for an example. In motorcycle terms, the word ‘rally’ can mean a gathering of like-minded riders laughing and telling lies in a beer-can littered field, but ‘rally’ also conjures up images of endless sand dunes and boulder strewn tracks en route to the finish line of the Dakar. As excellent a bike as it is, the Caponord Rally is simply not suited to slamming virgin sand dunes, and of course Aprilia would not claim it is. Essentially, this is a long-haul tourer with some inbuilt terrain versatility. Having said that, ultimately, the purpose of a motorcycle is in the mind and imagination of the key holder, and we motorcyclists are a creed known for pushing our boundaries and luck. The mere suggestion of a bike’s potential, perhaps innocently contained within its name, can have us thinking of putting the marketing spin to a death-by-sword test. And what’s the harm in that – apart from the potentially and metaphorically obvious? Rather than writing this test in a mad dash after a launch, as is often the case, I’ve had the luxury of riding the Caponord Rally several times and in vastly different environments, from cruisey highway touring to the depths of dirt and detritus. 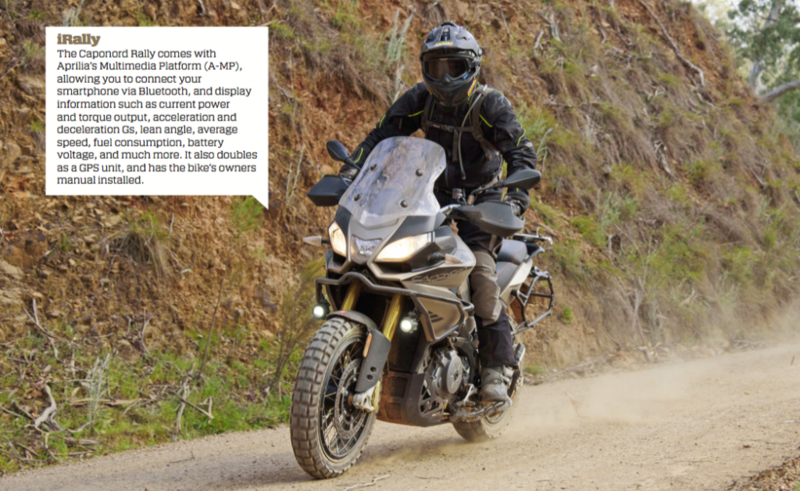 I’ve ridden the Rally over many hundreds of kilometres of tarmac and hard-packed gravel roads, and taken it up into the Victorian High Country, to see exactly what kind of ‘rally’ Aprilia had in mind when it renamed and ‘Rally’d’ its Caponord soft- roader, which was first released in 2013. 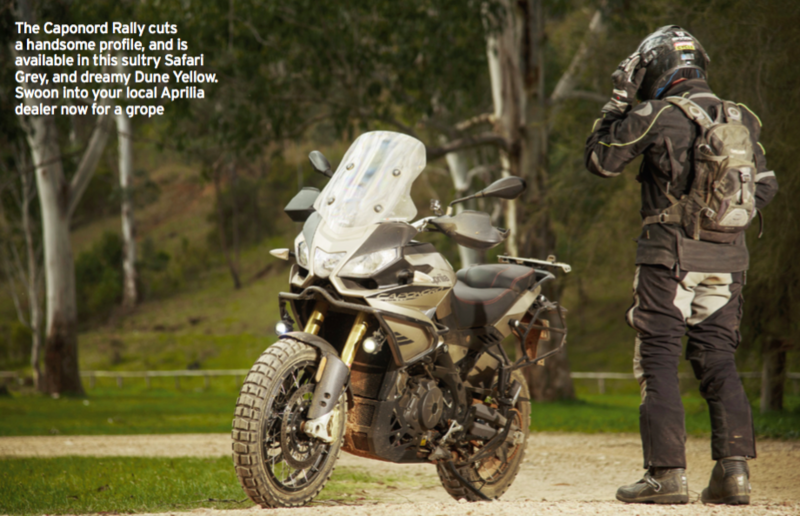 I first rode it at the Australian Caponord Rally launch in mid-2015, and my most vivid memory was of the bike’s ability to instantly make me smile, and feel at home in the saddle. The grin wasn’t a consequence of having a good fang (although that did happen), but simply because the bike was a joy to ride at the most basic levels: comfort and character. The moment we left Aprilia HQ in Sydney to start the journey into the Blue Mountains, I could tell I was going to love it. The V-twin at the heart of the Caponord is a well-developed and much-loved powerplant that can trace its roots back to World Superbike Championship-winning heritage, and it hasn’t lost any of its appeal by becoming an all-day tourer. What else has the Caponord Rally got going for it? In my opinion it’s a handsome contemporary design, typical of Aprilia, but first and foremost it has 54 world titles worth of experience channelled into its balance and driveability. These two aspects of its behaviour tell me this bike has been moulded by the hands of people with a solid understanding of the fundamental needs of a rider. Racing teaches you these things, and they’re lessons that transfer across all motorcycling disciplines – without balance and control, you’re fecked; a lack of almost anything else in a motorcycle can be forgiven. Next in order of commendation is comfort. Human bums don’t come in bulk sizes, they’re unique, but the one attached to me loves the Aprilia’s seat. Its sculpted shape gives support without overly limiting movement, and the depth and firmness of its foam is fitting for the bike’s long-distance directive. Likewise with the sweep and width of the handlebars and the position of the footpegs which, for my size, provide a roomy cockpit from which to watch the world whiz by. Removing the rubber footpeg inserts for dirt riding, or even changing footware from road to off-road boots, can alter the sweet spot for the gear lever, so it’s a nice touch to see an adjustable toe piece there. A huge amount of gearbox issues on motorcycles are caused by the gear lever being set in the wrong position for the rider, but it’s an essential adjustment which is often overlooked. The gearbox on the Caponord Rally has the immensely pleasing snickerty, snick, snick, snick of a transmission born from racing know-how, with its short, light lever action making smooth and easy work of each cog selection. Its clutch lever action is light enough to deal with trans-urban traffic without causing any major finger fatigue. Clutch modulation is excellent, making low-speed off-road manoeuvres more manageable. It also turns the Caponord into a somewhat unlikely but devastating weapon from a standing start. Aprilia’s EFI calibration technicians deserve a gold medal for the work on this bike. Loading up the engine with excessive throttle, even from idle rpm in top gear, doesn’t fuss the 1197cc V-twin at all. It simply pulls from any rpm in any gear with minimal crank-whip or vibration. This Rally version of the Caponord differs from the Strada and Touring models with a few detail changes designed to bring ruggedness and versatility to the platform. 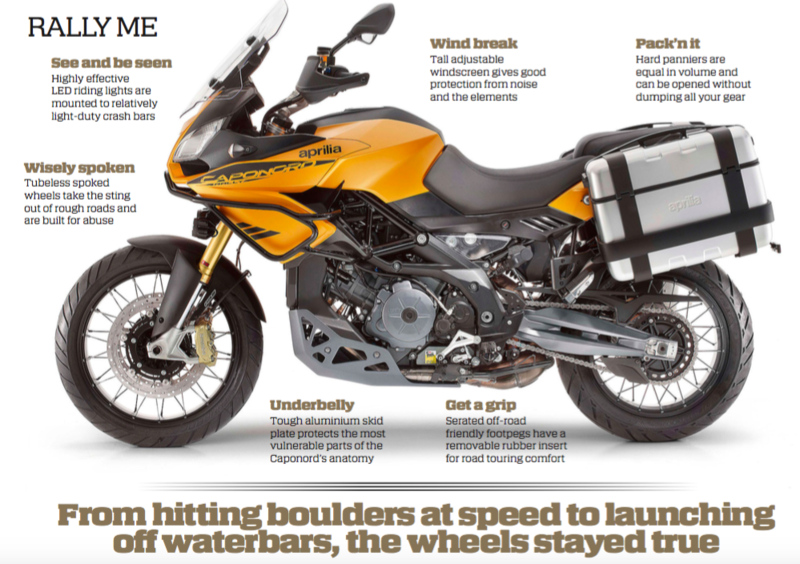 And although the engine and chassis remain largely the same, the bike’s intrinsic attributes do make the Caponord a good base for an off-road makeover. Yep, I’m talking balance and driveability again. Protection from rock strikes and crashes are essential for adventure riding, and the Rally has the main area of vulnerability covered with a substantial aluminium sump guard. The crash bars would benefit from an additional solid mount at the front, attaching to either the engine or frame, but there’s no doubt they will prevent a certain amount of damage in a low-speed crash. I proved this, purely in the name of conducting a thorough bike test, by dropping the Aprilia while manoeuvring it over some loose rocks for a photo shoot. The result was some slight scrapes, but no breakages or structural realignment. Higher speed offs may not end so happily, so best to just keep it right way up. Completing the Rally’s protection package are a pair of top-quality hand guards. These are tough,full coverage items, not just brush guards, keeping your mitts out of the wind and weather as well as saving the levers from damage in a tumble or tree strike. 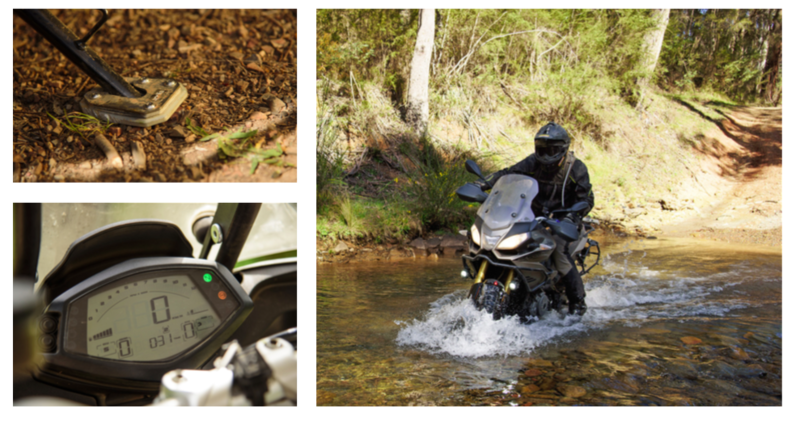 Although the heated grips aren’t included ex-factory, Aprilia Australia has now decided to fit them on all its Caponord Rallys – a beaut bonus for high country and winter adventures. More Rally-spec extras come in the form of the attractive spoked tubeless wheel set. These copped a serious pounding in the process of testing the bike, from hitting boulders at speed to launching off waterbars, and stayed true as the day they were laced. The 19-inch front and 17-inch rear combination gives a wide range of choice, covering everything from road tyres to full knobbies like the Pirelli Scorpion Rallys we fitted to go bush. The ancillary LED driving lights are standard fitment too, providing a useful boost to visibility, and enhancing headlight performance on the road immediately ahead. My only complaint here was, with no indicator on the dash, the switch could be better placed. Being out of sight at the front of the right-hand switchblock, you have to remember that down is the ‘on’ position when using them for daytime visibility. Tailgating cars to look in the reflection and check whether the lights are switched on probably isn’t such a good idea. The Rally’s hard panniers are well designed, and an enticing standard feature for the model. A two- way latch system allows you to open them fully, or just open the top. This helps prevent those comedy moments when opening panniers which are still mounted on the bike, only to have all your clean undies and toothbrush fall straight into a steaming pool of mud and buffalo excrement. Although they can take a bit of effort to remove, the upside to this is they are extremely solidly mounted, no doubt helping to maintain the bike’s exceptional stability. Balance and stability are also improved by having equal pannier volume on both sides – the low-slung silencer doesn’t infringe on any luggage space. No excuses not to take that extra whatsit or dooverlackie. A matching topbox is also available. Recently finding myself in the position of not having a real human person to take as a pillion, I found the panniers perfectly spaced to take one of my bicycles on holiday instead. Her name is Lesley, and even with Les strapped crossways and upside down over the pillion seat, the Aprilia’s stability at highway speed was akin to that of an ocean-going supertanker; incorruptible. I know this because I spent a great deal of the journey not actually steering, with the cruise control switched on and my arms folded neatly on the tank. Just joking sergeant, wouldn’t dream of doing something so daft. Unless of course I was legitimately testing a motorcycle’s stability for the good of the people. That’s my job. Speaking of the cruise control, sorry Aprilia, but you dropped the ball here, and I’m sure you know it. Setting the cruising speed is a tortuously tricky process of pushing a button on the right hand switchblock with your thumb while trying to hold the precise speed you require. Then, because there’s no way to trim the speed up or down once the cruise control is turned on, if you set the wrong speed you have to start all over again. It’s still a very welcome feature to have on a touring bike, but it could be so much better. 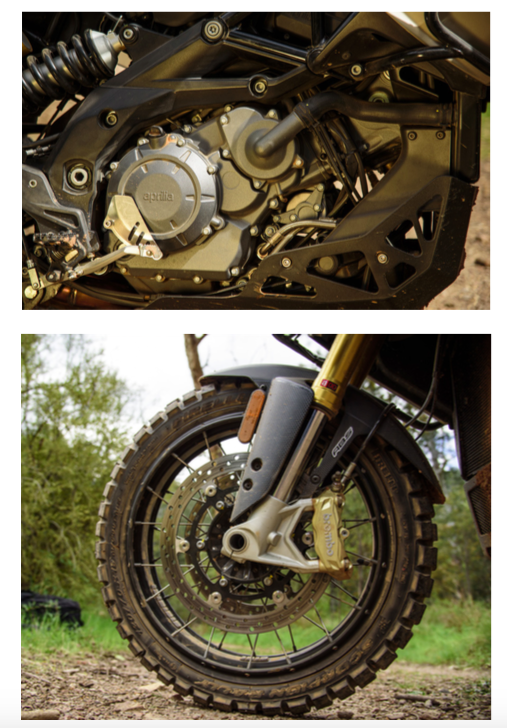 The centrestand is well balanced, and most importantly for off-roading, is also well sprung. There was never any aural evidence of it slapping around on rough terrain, even when fully airborne. A decent amount of wind protection and noise reduction is enjoyed behind the Rally’s broad screen, at least for someone of average to small stature. The height can be adjusted manually, but fiddling with it when in motion is definitely not recommended. A spring loaded on-the-fly adjustable system would be preferable, but in reality my adjustments were limited to ‘up’ for the highway, and ‘down’ for city and off-road riding. The Caponord’s braking is handled by Brembos all round, offering feel, finesse and power aplenty. A bigger rear disc and caliper could have been fitted for heavy dirt use and long descents, but it’s just as easy to let the engine take the strain, and also smells a lot less offensive than smouldering brake pads. The Continental two-channel ABS is a polished and effective system, but can also be disabled if you love a good skid. And who doesn’t love skids? While 238kg of heft and just 150mm of rear suspension travel are the limiting factors for the Caponord Rally in terms of off-road rampage, it is an excellent all-round package, and one which deserves consideration – especially if you are in the market for a versatile tourer with the ability to take you further than just the end of the road.